All Star Driving School Ltd. Yes, you can join the course any weekday or weekend. Just call our office and we can let you know what day's classes are running. It's up to the students when ever they want to start they have one year to fit every thing in. The Driver's License History provides proof of successful completion of and graudation from a BDE course and is widely recognized by the insurance industry as proof of course completion. Depending on area you live in, Make and color of your car, Your age all these factors will affect your insurance. What makes All Star driving school different from other schools? All Star driving school has been in the business for almost 30 years, with 13 different locations to better accommodate our students. Both in class and in car instructor are licensed by MTO and are re-evaluated by the owner every year. They are determined to provide the best service, our instructors are patient and take the time to help each student learn to drive and their own pace and comfort level. Customer satisfaction is our first concern. Our phone lines are open from 8:00 am till 10:00 pm from Monday to Sunday. When a student completes the full course In class in car and home work. 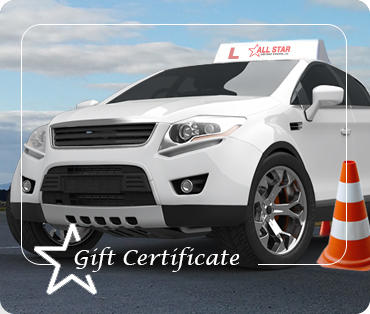 All Star Driving School will process your certificate and than you can walk in to your closest Service Ontario location to pick up your certificate. But please call us or check on line if you are certified before you go there. Do you pick up and Drop off?? Yes we do unless it's restricted area. Why are All Star Driving School prices so much lower than other driving schools? Do more expensive schools offer more to their students? All Star Driving School puts their students first, trying to keep prices as low as possible. All driving schools that are approved by the Ministry of Transportation have the same certificate provided at the end of course completion, no schools can offer a greater or lesser insurance deductible. Since All Star has been around for 30 years the company does not need to put money towards advertising their name. Our advertising is done through word of mouth, we are very thankful for the recommendations we have received from past students and their parents. All Star driving school is well known for producing strong and confident drivers, we are well respected driving school. I am out of town, Will driving instructor still come for pick up and drop off ? All Star driving School has 13 different locations to serve you better in your area. We cover our surroudings as well but if it's too far from our area you can arrange a meeting point with the instructor. We can even arrange that before you sign up. Would I be able to use my instructor's car? All Star driving School offer a one hour refresher lesson before the road test, You can also use driving instructor's car for the road test. All Star driving school has been in the business for more than 30 years and our driving instructors are very experienced with road test centers. We are known by examiners to bring our students for their tests only once they are ready to hit the road in real life. Yes you can use the instructor's car for an additional cost depending upon which test centre you choose to go. Copyright © All Star Driving Ltd. 2017. All rights reserved.